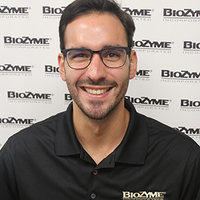 Cesar Ocasio Joins International Team at BioZyme® Inc.
BioZyme® Inc., is excited to announce the addition of a new member to its growing International Team. Cesar Ocasio has accepted the position of Regional Business and Innovation Manager. In his role, he will provide technical and commercial support to BioZyme’s partners and clients in Europe, Asia, Africa and Australia, while continuing to expand their list of partners and promoting the use of BioZyme’s additives in different countries around the world. He will also have the opportunity to contribute and be involved in the development of new ideas and research that will help continue understanding the benefits that the products offer. Dr. Ocasio earned his Ph.D. in Agro-Environmental Technology for Sustainable Agriculture from the Polytechnic University of Madrid in April 2018. He has spent the last four years working in animal nutrition, studying possible functional ingredients that can promote animal health. He completed his bachelor’s and master’s degree at the University of Puerto Rico, Mayagüez University Campus in the Department of Animal Science. In 2017, Dr. Ocasio spent 12 months studying at the Institute of Animal Nutrition and Physiology of the Christian-Albrechts-University of Kiel, Germany. There, he had the opportunity to learn new techniques and the German language, which allowed him to continue broadening and diversifying his scientific knowledge. “We see in César a guy with a lot of potential that we want to train and educate properly to make sure that he has all the tools to give his best for the success of the International Business. He is technically very sound, and we are still teaching him more about the feed industry and the best way to approach our partners and their customers,” said Volker Altenbokum, BioZyme’s Director of International Business Development. Dr. Ocasio currently lives in Kiel, Germany, with his wife, Gianna Kühn. With a combination of their Puerto Rican and German heritages, they enjoy cooking, traveling, spending time outside, going for bike rides, dancing and enjoying time together with the family or friends.